Whenever I read Greek mythology, I am always intrigued by the intricacies of the gods’ relationships! 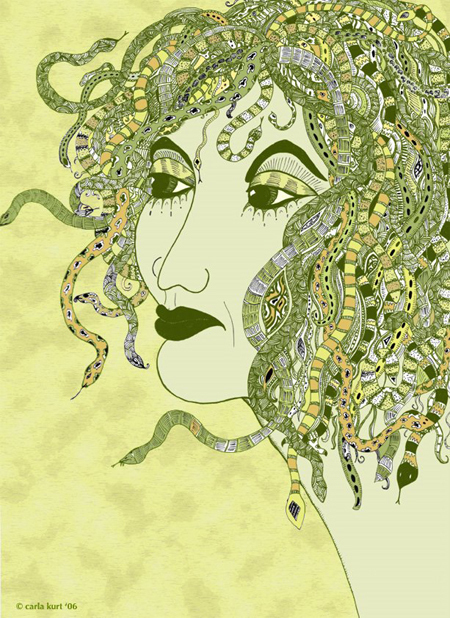 This is a drawing I posted a few years ago, along with the story of Medusa. The Gorgons of Greek mythology were so hideous that the mere sight of them would turn anyone who gazed their way to stone. They were, according to the poet Hesiod, so frighteningly repulsive to the senses that they “were not to be approached and not to be described.” Medusa, the only one of the three who was mortal, was born beautiful with a head of luxuriant, shining hair. The lusty Poseidon took a fancy to her, and disguised as a horse, seduced her in the temple of Athena. Enraged, Athena transformed Medusa into a monster whose most common portrayal shows her once beautiful hair as a mass of writhing snakes. In the very flesh of her scalp. Even as you stand before her. Than you can deafen your ears to. Would be hard to argue. The pedestals of your feet might move. Would fall to the floor like a lie.